In this modern IT environment, Office 365 mailboxes to PST exportation is a very common requirement. There are many reasons why a user needs to perform this export process, whether it is creating an offline backup of mailboxes or copying them into a transferable drive. Sometimes, users also find them-self in a situation where they require to import PST file to Office 365. 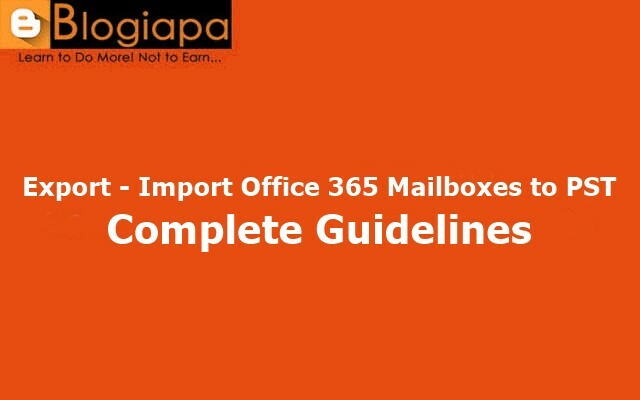 In each case, this write-up will help you to perform these process manually and also show you how to export-import office 365 mailboxes to PST. If the manual method doesn’t suit you then you can also try solution i.e Office365 Backup & Restore Software that makes the exporting importing task quicker. In this modern IT environment, Office 365 mailboxes to PST exportation is a very common requirement. There are many reasons why a user needs to perform this export process, whether it is creating an offline backup of mailboxes or copying them into a transferable drive. Sometimes, users also find them-self in a situation where they require to import PST file to Office 365. In each case, this write-up will help you to perform these process manually and also show you how to export-import office 365 mailboxes to PST. If the manual method doesn’t suit you then you can also try solution i.e Office365 Backup & Restore Software that makes the exporting importing task quicker. First of all, login Office 365 and go to the Admin. Then, select Exchange option from the left corner of the ‘Office 365 admin center’. Click on Permissions & select eDiscovery management under the admin roles. Now, you have to add your account to the Members list in the Discovery Management role group properties window by using the ‘+’ button. Next, go to the compliance management in Exchange admin center & click on the ‘+’ icon. Then, select the Don’t search any mailboxes option & click on the Next button. Now, you will get several filtering options. Then, apply the filters according to your need to search for the required messages. Finally, click on the down arrow button to export the search results to the PST and specify the location to save the PST file and start the export process. At first, log in your Office 365 using the administrator credentials. Then, go to the Import page and select Go to the Import service option. Now, you have Import files to Office 365 page, then click on the New job Add icon >> Upload files over the network to open that page. Here, you will get an option to download ‘Azure AzCopy’ tool. A new window will open up, click on Run button to install the Azure AzCopy tool at the default location. Once the tool has been installed, then copy & save Shared Access Signature (SAS) and the network upload URL to a file. Next, use AzCopy.exe tool to upload PST files to Office 365. For that, open the command prompt on your system. Then, go to the directory where you have installed the AzCopy.exe tool. To create a backup of Office 365 data, first, open the tool and log in your Office 365 account after entering the credentials. Then, select Office 365 Backup option. It will allow you to export pst from office 365 admin center. If you want to create a backup of only selective mailbox items, then the tool provides you an option to select desired mailbox items and desired location to save backup data in PST file. Now, click on Export button and select PST format to save all backup data in PST file. Then, apply the date filter and click on the Start button. It will take some time to download Office 365 mailbox items. If the process is completed successfully, then it will display a completion message. Just click on OK button. How to Import PST Data to Office 365? To restore the PST file, first, open the tool and log in your Office 365 account after entering the credentials. Then, choose the radio button next to Office 365 Restore option. It will allow moving your PST data to Office 365, click on Next button. Next, browse the PST file that you want to import and open it. Then, click on the Restore button to start the process. You can also choose the category, maintain folder hierarchy, and apply date filter option. After completion of the restoration process, just click on OK button. Here, both manual and quick solution is discussed that will help you to migrate Office 365 mailboxes to PST and upload PST file to Office 365. 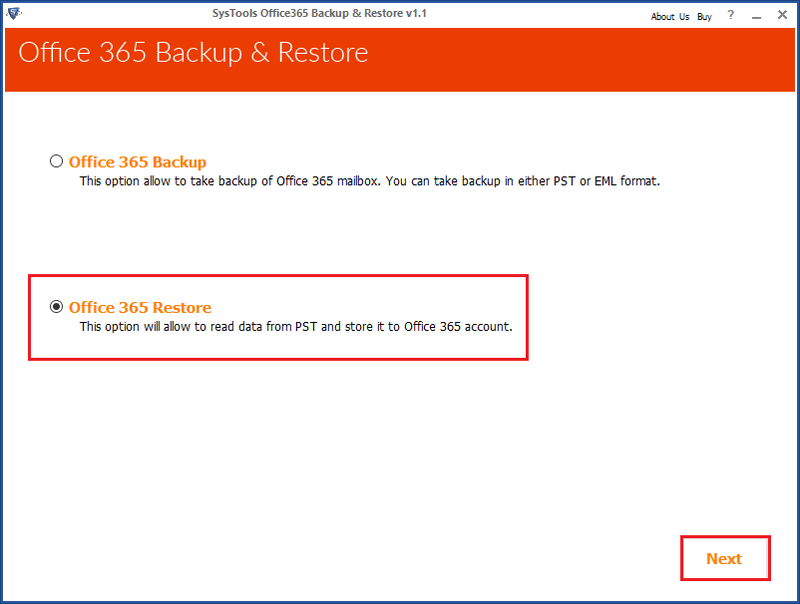 However, SysTools Office 365 backup and restore tool can easily export import Office 365 Mailbox items. With the user-friendly interface of this software, both technical as well as ordinary users to easily perform the migration process.